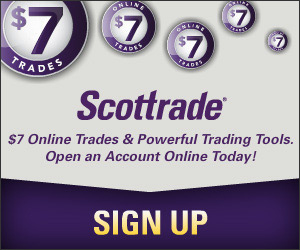 Early last week, I took a look at Scottrade trading platform because it’s the broker that I use the most for stock trading (not that I trade a lot). As you know, Scottrade isn’t my only stock broker. In fact, it is one of many brokerage accounts I own. Another *old* account I have is Firstrade. Though I don’t use Firstrade as much as I do with Scottrade, I still keep the account alive and trade only when I receive referral bonuses from referring new customer to the broker.I have discussed Firstrade briefly in my broker interface comparison post. Now I am going to expand the discussion a little bit, like I did with Scottrade. Firstrade, as a leading online discount broker, offers investors a wide range of investment products, from stock and options trading to mutual fund and fixed income investments. 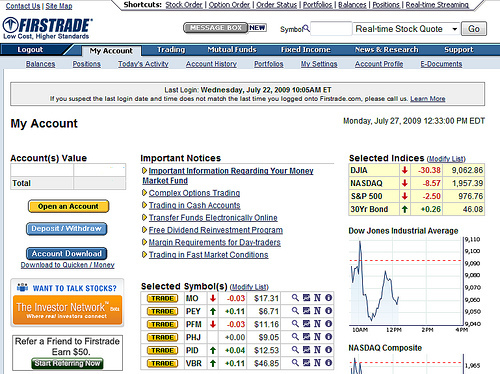 When I first opened my account with Firstrade, I was actually attracted to it by its free mutual fund trading. Unfortunately, that’s not the case any more. The cost of trading with Firstrade is rather high compared with what other discount brokers charge. For example, the commission for stock trade is $6.95 at Firstrade, which is lower than Scottrade’s $7.00 per trade, but significantly higher than Zecco’s $4.50 commission and TradeKing’s $4.95. Options trading at Firstrade will add another $1.95 per contract, where at Zecco and TradKing, the extra cost is $0.50/contract. However, Firstrade does have an edge over these brokers when it comes mutual fund investment: Firstrade $9.95, Zecco $10.00, TradeKing $14.95, and Scottrade $17.95 for each no-transaction fee mutual fund order. So what can you expect to see when you first log into your Firstrade account? Firstrade’s main website isn’t very impressive and I find it also not very useful. At the main account page, I expect to see the status of my account and my holdings so I can have a clear idea of how my account is doing. But that’s not the case with Firstrade, as you can see from the above screenshot. What I really don’t like about Firstrade’s account main web page is that the Important Notices section, which is supposed to list important announcement to users, takes a large space right in the center of the platform. I don’t find those notices very important at all and many of them are outdated and rarely updated. In my opinion, that place can be used for information that’s more useful for investors. Overall, I can’t do much on the account homepage alone because, as you may have noticed, what displayed on the homepage are not all related to trading, or even investor’s personal account information. There are only four pre-determined indices and two index charts to display. There’ s a list of stocks to watch, but it looks like I can only enter up to seven symbols. There’s even no list of positions on the homepage, only an account number with the current market value. If you want to make a trade, you will have to go to a different page to place your order by entering transaction type (buy or sell), symbol, shares, and order type (market or limit). This is the same as most other web-based trading platforms. Though there’s no streaming quotes on its homepage, Firstrade does have another tool, called X-Stream, that provides real-time streaming quotes, which can launched by clicking the Real-time Streaming on the top right corner of the main page. Firstrade’s java-based X-Stream tool allows you to track up to 20 stocks simultaneously (I’d say 20 is a quite small number). Every field and color is fully customizable and all quotes are updated in real-time as the market moves. In addition to quotes, you also have access to streaming charts with real-time technical analytics, streaming time and sale information, quick order entry, company profiles, and many other features. What I find weird is that though there’s a TRADE button in X-Stream, I can’t really trade from it. If I click the button, it takes right back to the same web page to make the trade. Not very convenient at all. In addition, Firstrade also has another tool that allows you to track multiple portfolios in real-time and updates your profits or losses on each position and the entire portfolio in real-time without having to refresh. It’s called MarketAce Portfolio Manager. MarketAce shows you to track each stock’s performance for that day and from the purchase price. You can specify your portfolio name and customize all the positions for each portfolio. You may also enter the cash balance of your portfolio to get the total value of your account updated in real-time. This is a unique tool to Firstrade as far as I know. So overall, Firstrade isn’t very competitive in terms of trading cost, unless you also want to buy mutual funds through the broker. However, it does have some features that you won’t find at other brokers. If you are interested in trading with Firstrade, the broker is running a triple-bonus promotion that will give you 100 free trades when opening a new account, plus $100 account transfer reimbursement (if you transfer from another broker to Firstrade) and $100 cash back, depending on your account value. Check it out to get more details on how you can earn the bonuses. Sun, thanks for such a good website. I read it just about dailey, time permitting. Interesting and informative. What’s your thoughts on ETFs? I’ve been thinking of putting together my own portfolio. Just your thoughts. Thanks again. A Happy and prosperous New Year to you and yours. Tim B.